Sign up for our newsletter to receive the latest Livigno news and great offers! High in the Italian Alps and close to the Swiss border, Livigno is a pretty resort with a friendly, welcoming atmosphere. Thanks to its elevated position, snow is virtually guaranteed and the slopes, suitable for all levels of skiers and snowboarders, are open from the end of November to the beginning of May. Winner of the World Snow Awards in 2012, Livigno boasts an impressive modern lift system and plenty to do both on and off the slopes. It's a duty free resort, and if you fancy a little retail therapy there are over 250 shops to choose from. Livigno has over 115km of pistes as well as over 30km of cross country ski tracks. With 29 blue runs, 37 red runs and 12 black runs as well lots of opportunities for off piste skiing, there's something for every taste and ability. The main ski area is Carosello 3000 with its wide open slopes and fantastic tree-lined pistes, but well worth a visit is the Federia area tucked on the backside of the Carosello. This is where you'll find some of the most spectacular views and the best photo opportunities in Livigno. For the more adventurous, there's also a boardercross course, a funpark and a giant airbag, ideal for trying out those jumps and tricks in safety. A new gondola at the Carosello 3000 opened at the start of the 2018/19 ski season and is a high speed 10 seater gondola and takes you from the bottom to the top in under 9 miniutes. On other side of the mountain, the Mottolino area also has wonderful wide open slopes and boasts a 7km blue run, the longest in Livigno, as well as several superb off piste areas. This is also where you'll find what's often described as the best snowboard park in Europe, with some really interesting jumps. For a memorable photo opportunity, there's even a jump over an Italian fighter jet. Fun fact: Trepalle, one of the villages in the Livigno area, is the highest in Europe! 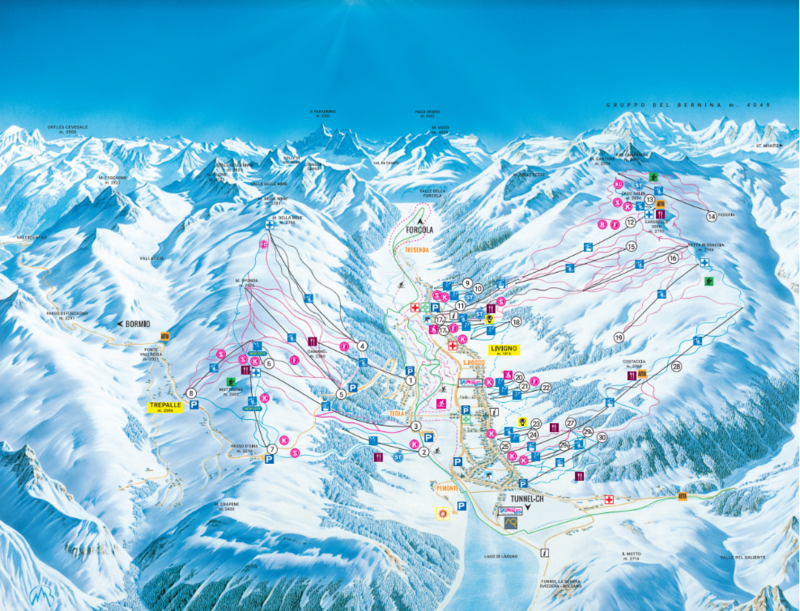 With an area ski pass (lift pass), you'll be able to use all the lifts in the Livigno resort on both the Carosello and Mottolino mountains. For free child passes and special family weeks, or to see a full list of prices including some great offers for first time skiers and snowboarders, please visit our Lift Passes section. If it's your first time on the slopes, don't forget to take a look at our all inclusive ski packs page for some great value offers. If you're renting your equipment, there's plenty of choice in Livigno with shops all around the resort offering a top quality service. If you book in advance with us, you'll save money on booking in the resort. We have everything from a basic carving ski which is suitable for beginners or the more cautious intermediate, to various standards of intermediate and advanced skis. We can also pick you up from your accommodation and take you to the rental shop when booking certain accommodation with us. Visit our Rentals page to see prices and types of equipment available. We've partnered with every ski school in the resort to give you not only complete flexibility but also the best prices and value. We'd recommend group lessons for skiers and boarders of all abilities, as they're a great way of meeting people in a relaxed, sociable environment and swapping tips. If you'd prefer a quick refresher to brush up on your technique or you'd like to work on something specific, you can also book a private lesson by emailing us Whether you're a complete beginner, an intermediate or an expert, we've got the right tuition available to suit you. We also have specialist off-piste guides available. New for this season we also have our "FunSki" package which is for children from 4 - 14 years old and includes, 4 hours ski school per day plus lunch and equipment all included for one great price. Visit our Livigno Ski Schools page for more info. We'd like to help you get the most out of your holiday. If you've booked accommodation, transfers or ski packs with us, one of the LivignoSkiHolidays.com guides will be available to show you around the slopes three days a week, free of charge.